Levels, crop, a little neat image. Walking in my city, i was giving a look at shops thinking that Christmas was over...I liked the squares I saw inside that shop. Hi, my name is Kari and from the critique club. The critique I am doing is for "Squares"
A couple of issues have come up in the comments re your composition, and the artifacts in the reflection ... this is often the way when you are photographing glass and hard to eliminate without the advanced editing options. I don't know that you hit the subject well. Yes there is a square and a rectangle, but they are not the subject the girl is. This is lovely and well done. Hard to do here, as it is potentially off subject, the reflections have also dampened peoples opinions. You found an interesting subject to photograph. You can tell from the stats that some liked it and some didn't. You can not appeal 100% to everyone. I look forward to seeing more of your shots. If you've got any questions about this critique, please feel free to contact me via the PM system. 2 - This is a shot of 'another shot' primarily in my opinion and the 'squares', while do add to this, are not the main subject. I would've preferred the lampshade to be square as well. But good otherwise. Except for the reflected lamp midframe to the left and the reflection artifacts at the top, this would be a 10. Wonderful image. Bright. Beautiful focus. Love the Mondrian rectangles. Cute model. Absolutely terrific composition. Might be a little heavy on the noise reduction but I can certainly live with that. Then there's that darn lamp. Still a great shot! Deserves a top 10 if not a ribbon. The reflection of the lamp in her hair isn't good. Is this actually a person, or a billboard behind a window? She is beautiful, but the skin looks over processed. I love the composition. Its intriguing. Maybe I'm missing something, but I don't get the face in the photo. Also you can see a light in her hair. beautiful model, shame her lips were covered up, not sure why you did this. what is that reflection in her hair? Interesting image. 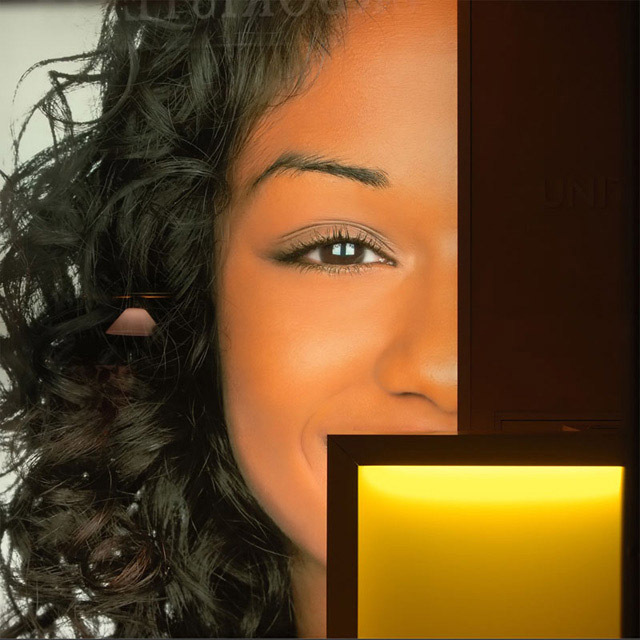 The reflection of the lamp in the model's hair and the other reflections at the top are distracting. The reflections in the window pane are distracting. Intriguing. Looks like a portion of an ad. Where the reflections of the light fixture and text intentional? The title draws my eyes to the incomplete yellow square and sends me looking for other squares to no avail. Excluding the title, the shapes within the locks of hair, face and and right-most UNI text are very interesting. am i crazy or is there a reflection of a lamp in the picture? Proudly hosted by Sargasso Networks. Current Server Time: 04/19/2019 04:19:22 PM EDT.